Hang your hummingbird feeder from the Anti-Ant Detourant to prevent ants and crawling insects from accessing your hummingbird or oriole feeder. Simply turn the Detourant upside down, fill the large capacity reservoir with water, slowly upright the Detourant, and hang a feeder from the hook below. The water in the cup prevents the ants and other insects from reaching your feeder. 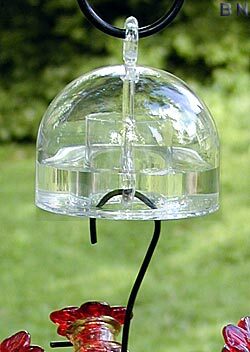 This unit may be used with any hanging hummingbird or oriole feeder. Prevent ants from soiling your nectar with this Anti-Ant Detourant. Note: Some large feeder hangers may not connect directly to the hanging ring at the bottom of the Detourant. If this is an issue, we suggest using a short S-hook, small key ring, wire, etc. to link the Detourant to your hanger.